Furnishing your new apartment when you’re a newly minted adult is the thrill of a lifetime. A sofa! A nightstand! Real decor? Unfortunately, the vision you have for your space won’t always align with your budget. (That happens at any age, BTW.) Still, there are so many more resources and sites to shop out there now (check out our favorite affordable art websites here) other than Ikea… but we also included Ikea. Avoid the cookie cutter post-grad space and embrace affordable modern design with our choice of shops. 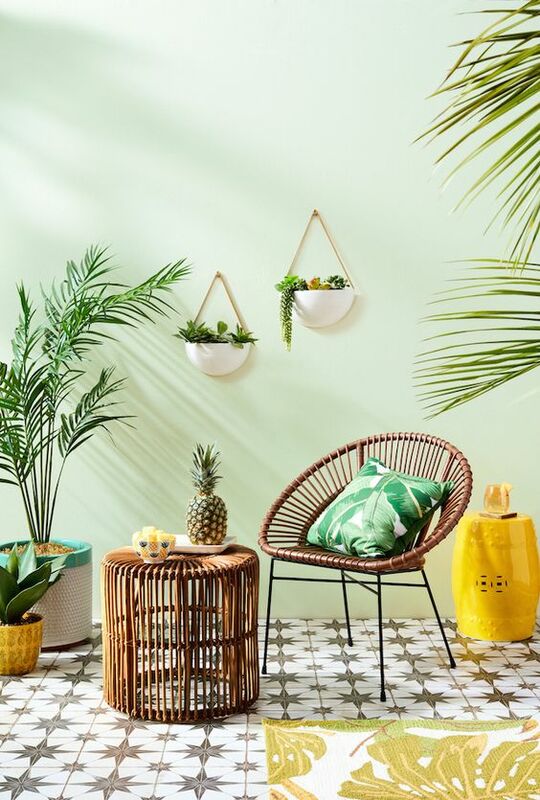 Yes, you can shop for decor at Walmart—the big box retailer has some seriously stylish options, in fact. Not only does the mass market brand have something for every design style, their offerings look high-end, so nobody will ever guess you got them for cheap. Small-space dwellers, if you haven’t checked out Pottery Barn’s line PB Apartment yet, you’re seriously missing out. Specifically designed for those without a lot of room or funds, it consists of innovative solutions that’ll transform your tiny home. Article cuts out the middle man and gets you modern furniture straight from the manufacturer. Some of their sofas fall on the more expensive side (as compared to some big box retailers) but the chic design and high quality make the extra $$$ worth it. Los Angeles-based TINI literally stands for “This Is Not Ikea.” They find the coolest, authentic, vintage, mid-century modern furniture for you, and make sure they’re at an affordable price. Be sure to browse their online shop—although they’re based in Cali, they ship nationwide. As if Target isn’t already your go-to for all of your home needs. But now, add it to your list of affordable places to find furniture. They have picks for every aesthetic pre-sorted online (shoutout to recently released brands Made By Design and Opalhouse), so it’s easy to find pieces that fit your individual style. If your design aesthetic is more bohemian and less modern, look to UO. They sell an endless number of furniture pieces that work in small spaces and are affordable for all 20-somethings. Our favorite selection of furniture on their site is all of their side tables—the one to your left is only $129. Chairish’s online shop features 75,000-plus curated items that are ready to ship straight to you, today. Products are sorted into specific styles at various price points, and each piece of furniture on the site is listed by an individual or vendor. So, it’s just as easy to connect with people who are selling beautiful furniture in your city as it is to get something shipped ASAP. If you’re looking for anything and everything to furnish your apartment, look here. We’re talking unique, modern designs without a jump in cost for every single room of your house. The furniture on AllModern looks super expensive, but is actually wildly affordable. Look here for unique designs at ikea prices Don’t be scared off by the pieces on the pricier side—we guarantee you’ll be able to find amazing steals. If you’re looking to create a zen workspace with effective storage, look to The Container Store. They have file cabinets, bookshelves, and desks that will fit any budget. Bonus: You can also purchase kitchen, office, and closet accessories. Warning: Even though CB2 is the younger sibling of Crate & Barrel, it still might be a bit out of your price range. Most accent tables hover around $200, not $100, so if you’re looking for an upgrade that will maybe crack the bank (instead of breaking it), look here. Yes, The Home Depot sells furniture. Most of it is more traditional in design, but buying your basic, bare-bones furniture here will save you money. Think inexpensive bed frames and bookshelves, all available in five different wood stains. If you’re not familiar with jet.com, it’s a marketplace that sells pretty much everything under the sun—including furniture. Look here for real bargains and lots of small space solutions. Wayfair is a great online resource to surf when looking for new furniture—they sell just about anything you could ever need for your apartment or home at a super affordable price. They also have so many variations of every piece you’re looking for (think a million headboards, different categories of sofas, etc.) that the store makes for a great place to find inspiration. This post was originally published on February 9, 2016. It has been updated with new information.